We all have dreams, whether we speak about them out loud or not. The most common reason why we wouldn’t do so is because we didn’t see our other dreams come true. It seams understandable right? Over time our dreams can become our little secrets that we don’t invest much energy and time into to prevent disappointment or to look foolish. So how do we regain the confidence in our ability to make our dreams come true again? Well, I think we just need to try a new approach. We know that the a lot of top athletes out there think of visualizations as an important (if not the most important) part of their training and strategy to win. I have always been a daydreamer. Many times it got me in a trouble but looking back at my life, I know I live the life I do now because I did not treat my daydreaming as a waste of my time. I also researched the topic of visualization and intentional manifesting for the last 8 years to find out what is the secret of visualization. By far the best explanation of what is often going wrong with the approach we take to visualization I have ever came across is the video below. 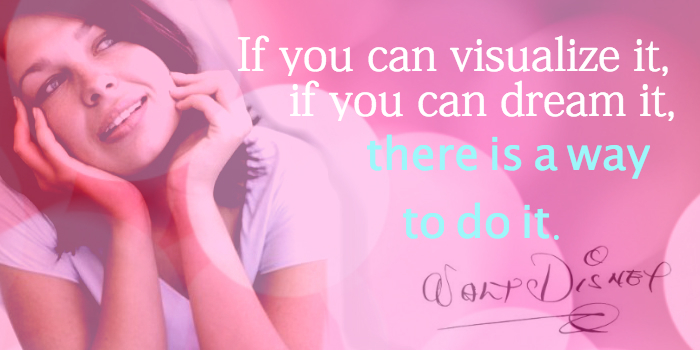 Visualization – something we do versus a state of being we take on. The woman in the video says: ” The (big) vision (of her life) has always been with me and I haven’t let go of it”. I am sure many of you can relate to that statement. Here is the important message Bashar has for the woman in this video, and for anyone reading this blogpost. “The visualization that happens in your physical mind is simply a representation, a symbol, of a state of being.” ~Bashar. 1. Understand that it’s purpose is to use is to generate a level of excitement in you that’s is representative of that state of being but the visualization may NOT necessary occur as your physical mind was capable of imagining it. 2. Ones you have’ve used the visualization in your mind to get your self in that excited state, you absolutelly let go of any need whatsoever for that particular, specific visualization to have to come to manifestation. And you hold on to the state of being itself and than you give that state of being to your higher mind which has the ability to know how something is going to happen. 3. Don’t prevent the higher mind from giving you something better by insisting that the visualization in your physical mind must be the end all, be all of how the manifestation has to occur. Because what to the physical mind seams to be the sealing, to the higher mind is just the floor. And it can go much higher than the physical mind is capable of doing, and bring you something far greater than you imagined. So don’t limit it. The secret of Visualization: letting of of the need to know how things are going to happen/manifest and only using this technique to create a state of being – an energetic invitation that will allow the universe to orchestrate the hows so we could realize our dreams OR SOMETHING EVEN BETTER. Giving up control is not easy for many of us, but it is really important that we start giving up our fears and start “training” ourselves to believe that we are supported in each moment to achieve our dreams – in a ways that are expected AND UNEXPECTED. Have an amazing day and dream on.